Washington, NJ: High hardness wear plates from process equipment manufacturer The Witte Co., Washington, New Jersey (www.witte.com), protect inlets, curves, discharge sections and other points from premature wear due to high-impact contact with abrasive materials traveling at high velocities. Available on the company’s entire line of vibrating fluid bed dryers and coolers, screeners, plastic pellet classifiers, vibratory conveyors and other process equipment, the durable wear plates are offered in a choice of stainless steel, Stellite® alloys or Teflon® to help extend the service life of the fabricated metal equipment while accommodating a wide range of abrasive materials. The Witte wear plates are ideal for processing glass-filled plastic resins, ceramic particles, mineral aggregates, abrasive grains and other powdered, granular and viscous materials. The wear plates are designed for easy removal to permit quick replacement without requiring significant line downtime. 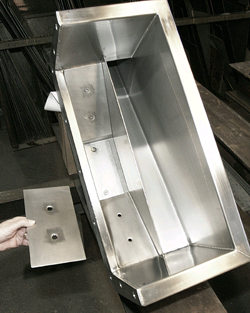 Though custom designed for each machine, the removable wear plates may be designed for retrofit on existing machinery.